Ministry of Defence through the One Rank One Pension scheme will soon make a big declaration for the Ex-Servicemen. Thirteen and a half lakh Ex-servicemen will receive a gift of increase in Pension before the first anniversary of the NDA government. 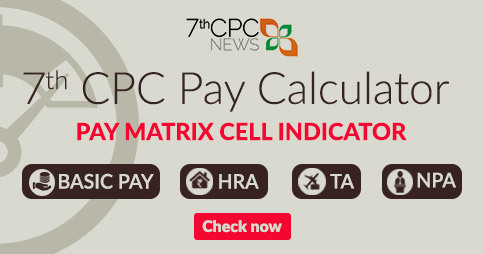 The task of preparing the full and final blue print of this scheme was assigned to the Seventh Pay commission. Ie. After January 2016, Ex-servicemen will be granted better Pension according to the formula recommended by the Seventh Pay commission and the One Rank One Pension scheme will be fully implemented. This will benefit the Ex-servicemen receiving less pension. Defence Minister Manohar Parrikar in an exclusive interview with ‘Hindustan’ stated that the government is very concerned about the welfare and Pension of the Ex-Servicemen. I believe that the Pension policy for them should be different and more Profitable than the general public. Surely they must get more pensions. He enlisted that the soldiers recruited in Defence at the Age of 17-18 usually retire after 18 years of service. Then their age is less than 40. Their children are small and their studies are at a critical juncture. The rest is the responsibility of the family. But after 18 years of military service when they retire, the retirement benefits (fund, gratuity, etc.) are much lower than those of the central personnel who retire in 60 years. Parikkar stated that, a bigger fact is that an Employee can experience the benefits of only one Pay commission in his entire life. Therefore there needs to be a better Soldiers Pension policy. Since a soldier gets retired early, his Pension is less. The difference increases with increasing time, while today the cost of living has increased. Therefore the demand states that every Soldier retired in one rank should have equal Pension. The government has agreed on the One Rank One Pension scheme. The plan has been worked on before and pension has been increased. But still there is a big difference. There is a huge difference between the Soldier who retired in 1975 and he who retires today. According to the Ministry of Finance, there is no such system by which this can be made equal. There are 13,48,517 ex-servicemen in the country who are receiving pensions. Ex-Servicemen from 1970 are still alive. In the last budget of the NDA government, one thousand crores was allocated for the One Rank One Pension Scheme, but as the formula was not ready, the expense was not incurred. Defence Minister has stated that the necessary arrangements have been made to provide relief to the Ex-Servicemen. The announcement will be made before one year completion of the government. Using the existing formula, there will be an increase in pension for the period April 2014 to December 2015. 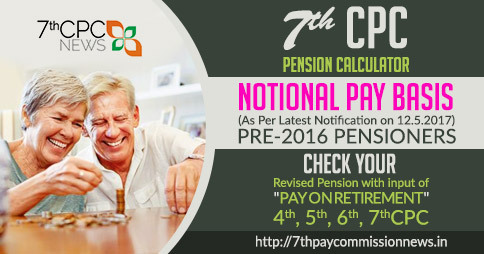 Then the whole matter is placed before the seventh pay commission so that the commission prepares a single formula for One Rank One Pension. He stated that the central government will collectively pose the One Rank One Pension scheme in an effective way, by which the earlier retired soldiers will receive a satisfactory pension compared to the currently retired soldiers. The lacuna in implementing OROP is for the rank of Major, Lt. Cdr and Sqn. Ldr. as no Officer of above mentioned rank has retired after 2013. 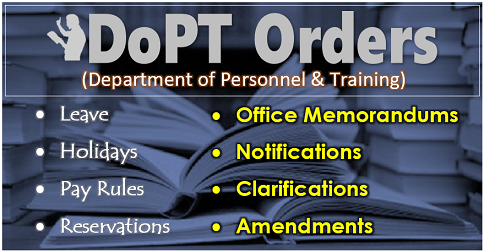 The OROP in letter and spirit is not applicable to this category of Officers. In number these Officers might be around 1000. Second problem with this category of Officers is that their service of 33 years has been truncated to 22 years on 01 July, 2014 thereby depriving them reduction in their pension by 33%. Hon PM and Defence Minister is requested to solve this anomaly. It can easily be solved by discussing with any Veteran of this Rank. I am Ex. Navy (Submariner) retired as PO in 1995. What will be my DL -33 arrears. As per Circular 568 Annexure `D` pension should be 6420 w. e. f. 1/1/06 Was not received by me. 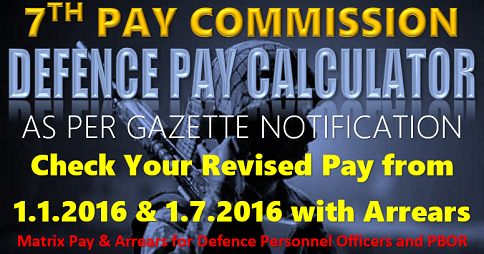 PCDA Circular 555 dated 04/02/2016 para no 11(C)pensioner, who had retired with a particular rank and granted ACP-I will be eligible for revision of pension of new higher rank of ACP-I These all above increment when will be adjusted in my account. I’m ex Sgt (gp Y) retired on completion of 15 yrs pensionable service on 30.6.1982. Please let me know what is my basic pen as per VII PC . My daughter is single girl child and as per CBSC she have exception in school fees. Now can I claim only books and uniform bill as CEA.. I Rtd In apr 1992 as a Hony Nb Sub in C gp for 24 years. I Wa nt to know increased total salary With bipercation.Than q Sir. my mb no is 9573108314. plz send me message. Sir I m ex navy CPO but I used to received the Penson ofPo. Will I get the Person of CPO from OROP. I am an ex servicemen retired from air force after 17 years of service in the year of 1981. What will be my DL33 arrears and when I will get it. Please intimate me at the earliest. 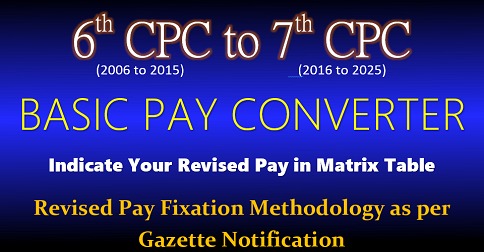 7th pay commission benifits to all ex service man. 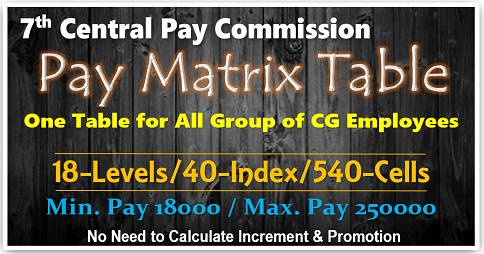 Plz sent me latest pay scale of ex Other & ex jco’s. 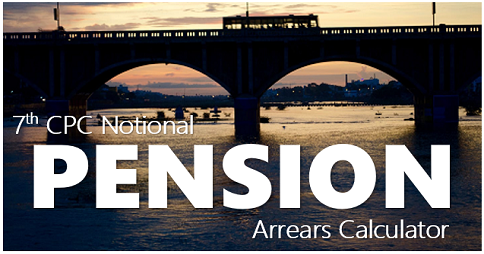 Please intimate any new news regarding exarmy pensioners.